Visit Ford for more information on the Ford Edge. Emissions: Federal standards Tier II/Bin 5, LEV II; California standards ULEV II. Cargo Volume behind front row 68.9 cu. ft.
behind second row 32.2 cu. ft.
FWD 63.1 sq. in., AWD 69.79 sq. in. 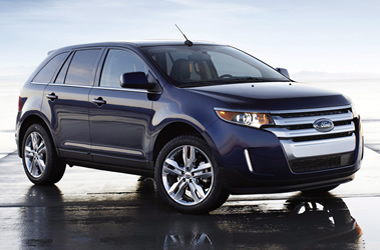 Get a Price Quote on a 2012 Ford Edge.